If you’ve been following this blog for a while, you will know what a big fan I am of Bethnal Green’s charming Town Hall Hotel. Having lived in the East End for most of my adult life, I’ve enjoyed many a great meal over the years at the Town Hall’s fine dining restaurant, Viajante when Chef Nuno Mendes was at the helm. Hence, when I heard the news last year that Mendes was leaving the East End for Chiltern Firehouse, I couldn’t help but feel robbed of one of my neighbourhood’s finest eateries. Whoever picked up the gauntlet here at the Town Hall sure had some big shoes to fill. 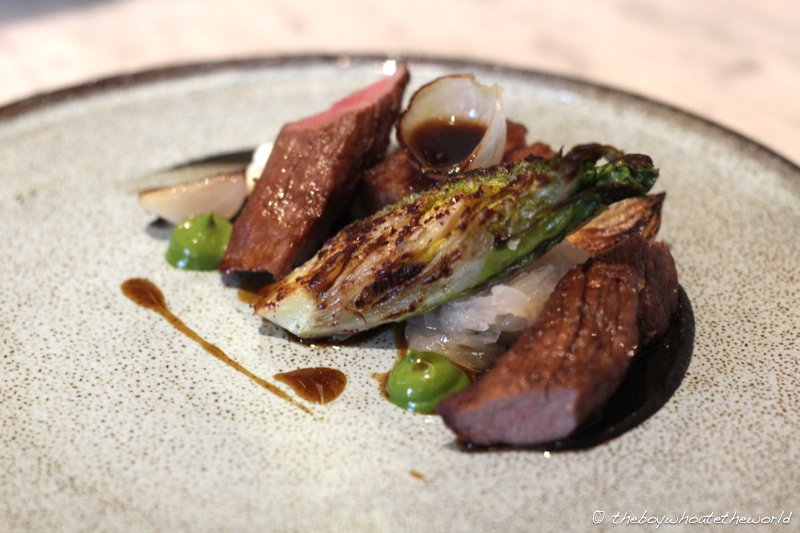 Step up Chef Lee Westcott and the Jason Atherton empire to the rescue. New management teams can sometimes come storming in, tearing down the walls and revamping the style of food of an establishment. Thankfully, that wasn’t the case here. In fact, things at the Town Hall Hotel seem to have continued in largely the same vein as previously which will be music to the ears of former Viajante fans. The eponymous dining room, renamed after the Old Town Hall’s ‘Typing Room’ has kept its casual, neighbourhood restaurant feel that has kept me coming back time and time again. What’s more, Westcott’s contemporary cooking style – full of cutting edge flavour combos, textures and modernist techniques – echoes of the culinary ingenuity that won Viajante its Michelin star. 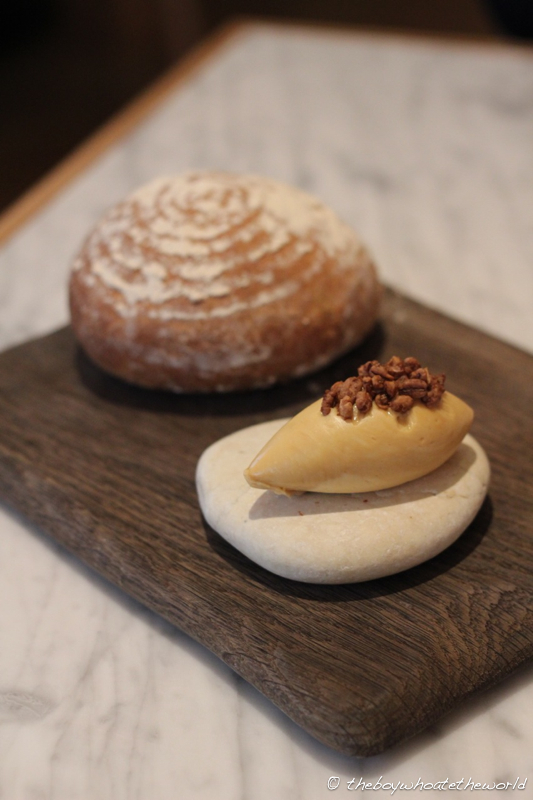 Their IPA-flavoured sourdough, served piping warm from the oven with a quenelle of their velvet-smooth, Marmite-spiked butter is SUBLIME. A crusty exterior envelopes a moist, aromatic core bursting with malty, yeasty goodness. This is easily some of the best bread you will find in town and it comes compliments of the house. Onto their bite-sized ‘snacks’. And at an additional £2.50 each for literally one bite, they don’t come cheap. But beautifully crafted they all are and the attention to detail crammed into each is pretty incredible. A crispy cradle of Cod skin, topped with smoked cod mousse and an emulsion of oyster and dill is a celebration of the sea. Deep-fried nuggets of Pig’s trotters were crunchy on the outside and melt-in-the-mouth on the inside. I yearned for a bucket of these with a large pot of their delicious bacon and brown sauce jam on the side. Starters were even more impressive. Buffalo milk, engineered into a light, skin-like gel and wrapped round a filling of sweet carrot was an ingenious dish and my favourite of the meal. 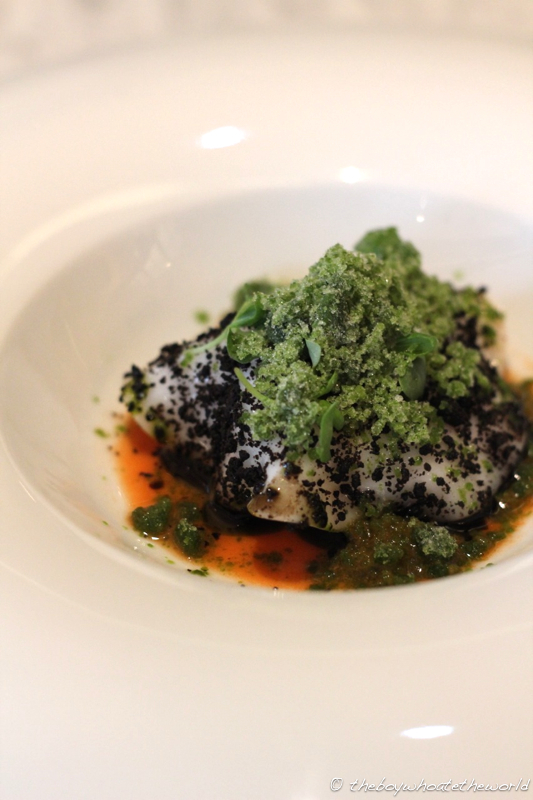 A savoury coating of black olive ‘soil’ on the outside and a topping of fresh, ice-cold sorrel granita provided a marvellous contrast of flavour and temperature. 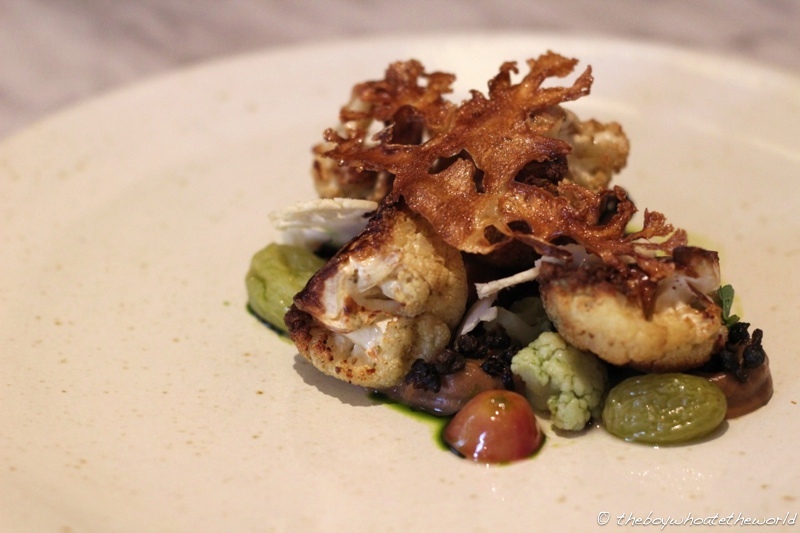 Textures of cauliflower – raw, deep-fried, chargrilled, pickled & puree’d – paired beautifully with the raisin, caper and fresh mint garnishes. Main courses were more of a mixed bag. Lamb loin and belly were tender, tasty and cooked to perfection. Every garnish on the plate from the charred baby gem to the barbecued aubergine puree all came together to create a wonderful symphony of flavours and textures. The Octopus dish however didn’t quite hit the mark for me. 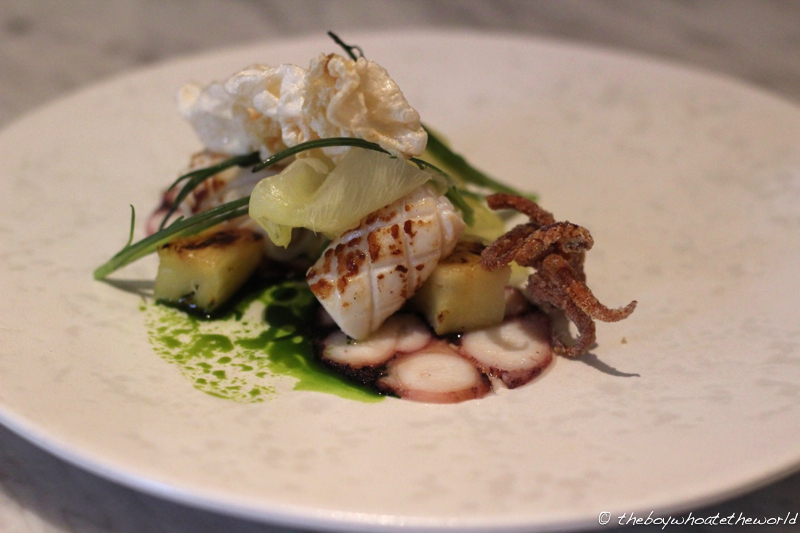 There was nothing wrong with the way the various pieces of octopus were cooked and prepared. The burnt pineapple, dehydrated beef tendon and basil oil garnishes, although delicious in their own right, just didn’t quite come together to complete the dish. We ended with a delightful pudding of Rhubarb, Blood orange and Wild Rice. 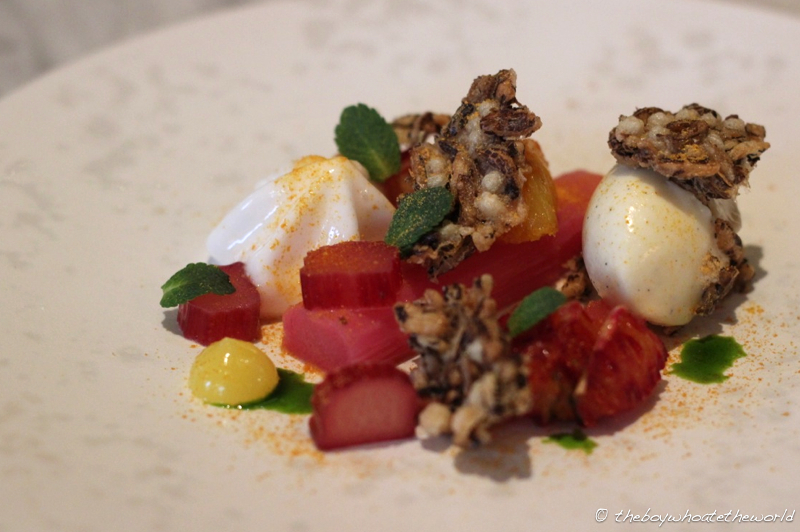 The sweet and tart flavours of the orange and rhubarb were balanced beautifully by the creamy vanilla ice-cream, cool mint leaves and earthy crunch of the wild rice crispies. What gorgeous plating as well – the eclectic shapes and vivid colours literally leapt out from the plate. All things considered, it was quite the glorious lunch on the whole with top notch food all round. Not only were Westcott and team’s dishes inspiring in concept but the majority of them delivered layer after layer of harmonious flavours and textures. If you ask me, everything about the restaurant is already firmly in 1 Michelin star territory so my feeling is that it’s just a matter of time. I will most certainly be back here soon to sample their full tasting menu. ggot much clear idea regarding from this article.